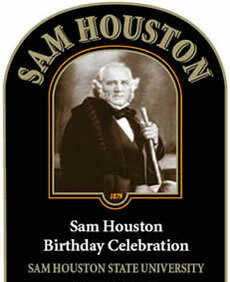 He won’t be around to celebrate, but Sam Houston’s memory will be honored when his namesake university, Sam Houston State, throws a birthday party for the man who is one of Texas’ most revered historical figures on Tuesday (March 3) at The Bob Bullock Texas State History Museum in Austin. Houston---governor of two states, president of the Republic of Texas, U.S. senator, and military hero---was born on March 2, 1793. He spent his final years in Huntsville where the university, named in his honor, is located. The Austin event, which will be held from 6:30-9 p.m., is sponsored by Sam Houston State University President and Mrs. Jim Gaertner and the SHSU Alumni Association. “We are inviting state officials and members of their staffs to join alumni and friends of Sam Houston State University to honor the legacy of Sam Houston and his contributions to the great state of Texas,” said John Hoyt of Waco, president of the SHSU Alumni Association. “Houston was a supporter and advocate for education,” Hoyt said. “Our university, which carries his name, was founded as a teachers’ college. Tickets are $20 per person. Reservations are requested by Monday (March 2), and can be made by calling 800.283.7478 or logging on to http://alumni.shsu.edu.